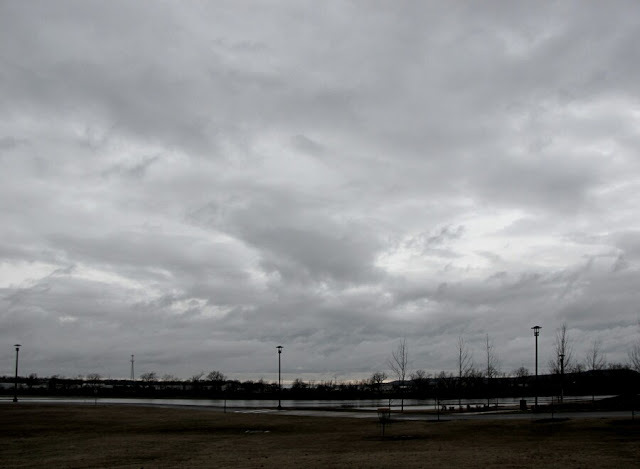 Skywatch Friday - Spring is Coming! 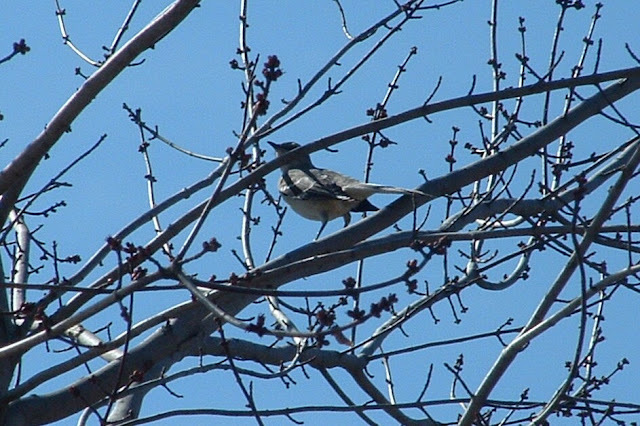 My maple tree is budding and the Mockingbird is singing. Surely Spring can't be too far away. 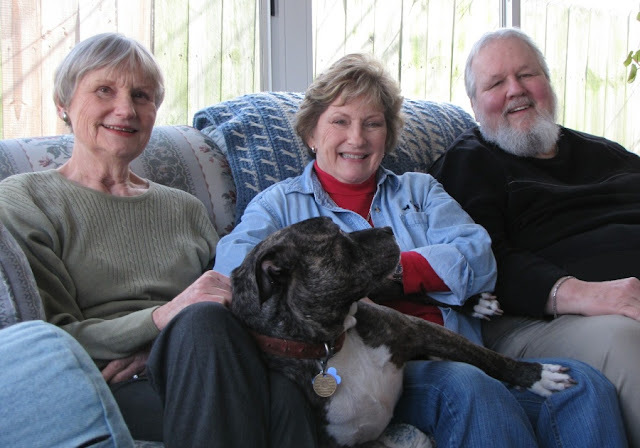 Today I met with my favorite cousins Catharine and Glenda to work on our common ancestry. Among us we have a lot of old photographs and letters going back to the civil war and before. We started last year scanning pictures and transcribing old letters so that our family history will be preserved for later generations. We accomplished quite a lot then took a photo of our reunion. Of course Smokey thought he was part of the family and climbed right in. I have some very nice looking cousins, eh? 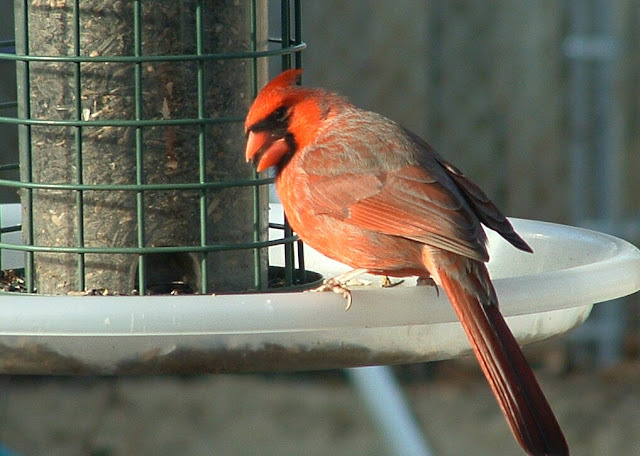 The male Cardinal is bright red all over. The female is more a rust color. This time of year the songbirds are hungry. 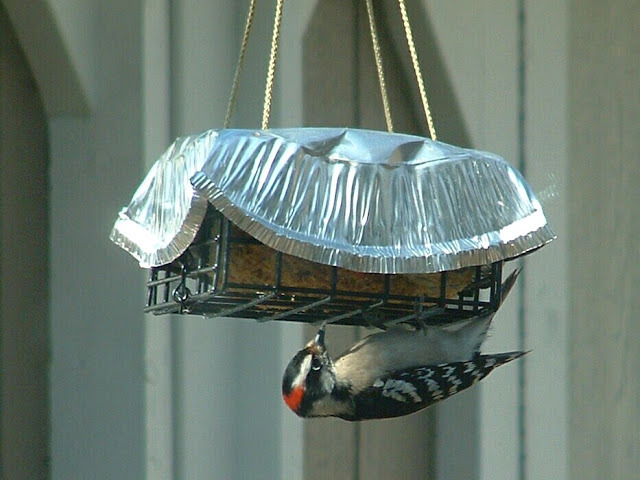 Putting out a seed feeder is a big help and they will reward you by flocking to the feeder and doing a dance for you. I prefer black sunflower seer, safflower seed, and thistle for the finches. Less desirable birds like starlings, grackles, and sparrows will sometimes push others away from the feeder but hey, they are hungry too. 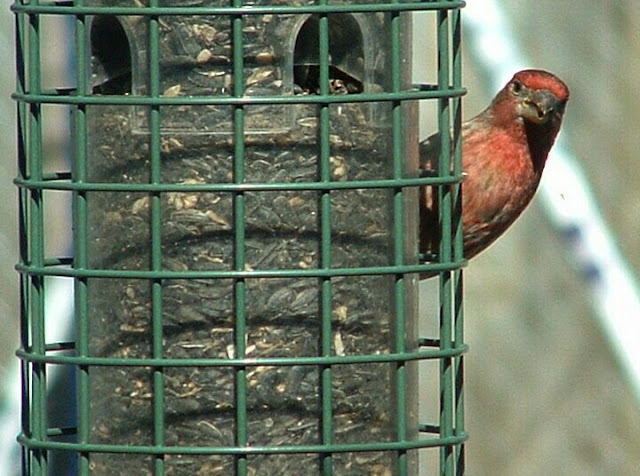 The little House Finch is a regular at the feeders. He looks like a sparrow that has been sprayed over the head with red paint. This is a view of the Philbrook Mansion from the south garden. 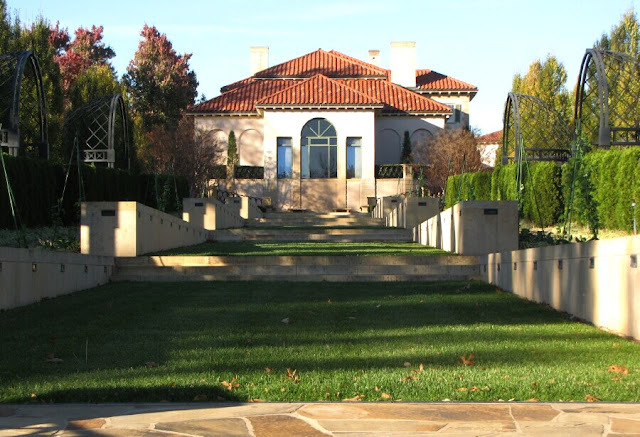 This is a view of the Philbrook Mansion taken from the south garden. I took this last November but do not think I have posted it before. I was reminded of it by my friend Yogi who did a very nice post of Philbrook today in his blog Yogi's Den. It is worth a visit. 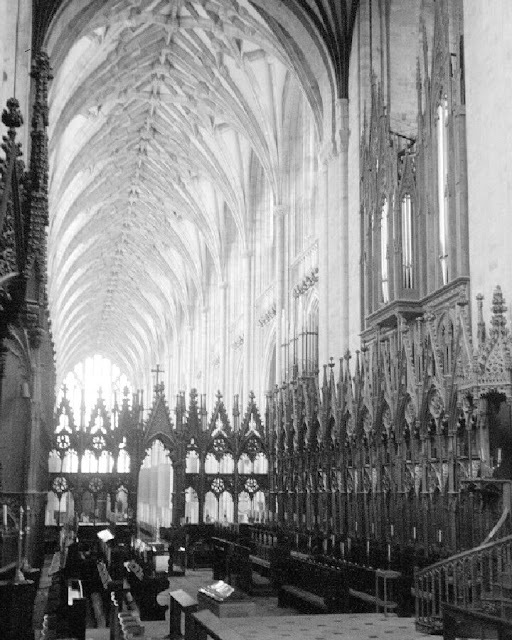 Last weekend I shared a photo of the beautiful sanctuary of Winchester Cathedral. From the same place from which that picture was taken, I turned around and looked down the beautiful choir area through the long nave to the porch. It is called the "nave" from the same word as navy. The church is the ship of life which carries us to the Lord. 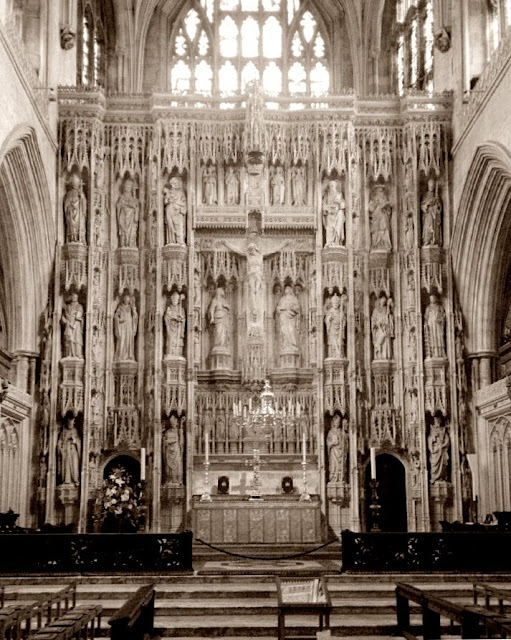 The delicate wooden tracery which decorate the misericord of the choir is amazing. This exceptionally beautiful cathedral was begun in the year 1079 and has an interesting history. The church is still is regular use with an ambitious schedule of services and activities. They have an interesting web site. 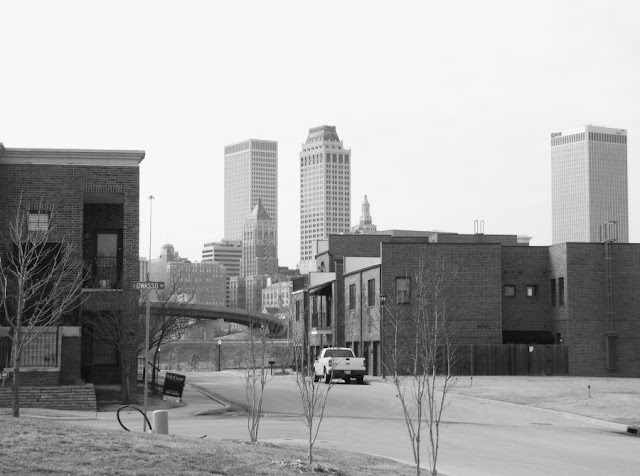 Route 66, the Main Street of America runs through the heart of Tulsa. The elegant Mayo Hotel in downtown Tulsa was the subject of my post of November 16, 2009. Riverside Drive is a popular place for apartments. They all want a view of the river. Click to enlarge. 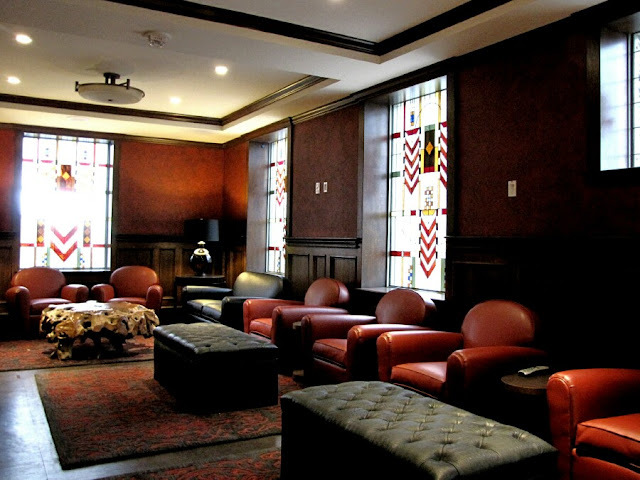 The Mayo is an elegant old Tulsa Hotel that was empty and in danger of destruction. Thankfully it has recently been renovated. For more see my post of November 16, 2009. 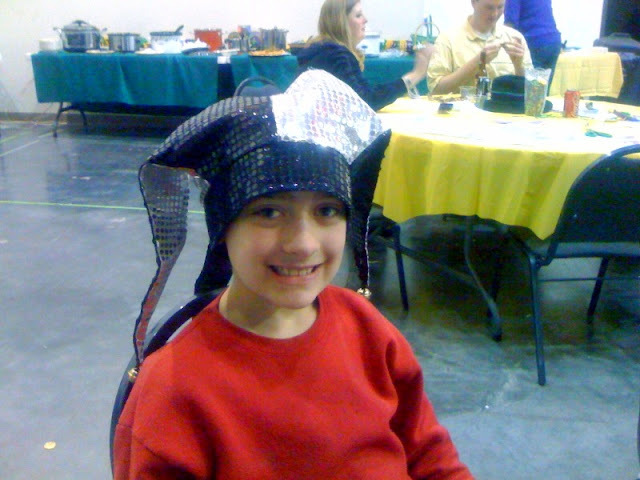 Saturday evening our church had a Mardi Gras party and Willy got to wear a Foole's cap. Foole in the sense of a clown. Willy makes a good clown. We all had a nice time. In 2000 I was privileged to be part of a group from Tulsa Community College that spent 10 days touring England and France. We traveled through Winchester where I discovered that Winchester Cathedral is more than a song by The Beatles. Winchester Cathedral at Winchester in Hampshire is one of the largest cathedrals in England, with the longest nave and overall length of any Gothic cathedral in Europe. It is exceptionally beautiful. Gambling is not legal in the state of Oklahoma. However, beginning in the late 1970s a series of decisions by the United States Supreme Court ruled that Indian tribes have limited sovereignty over tribal lands and may license gambling within their jurisdiction. 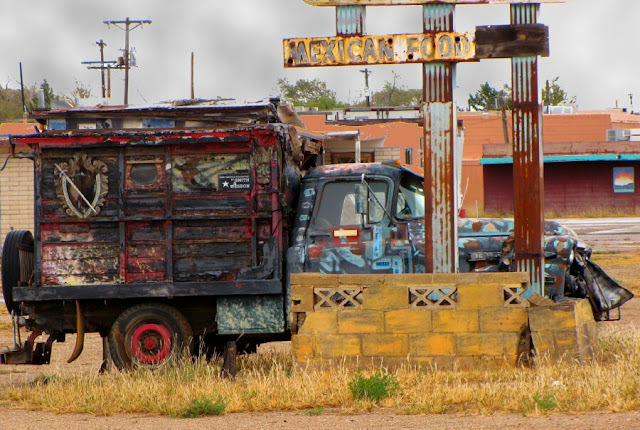 Since then Tribal gambling has rapidly grown into the billions of dollars across the country. 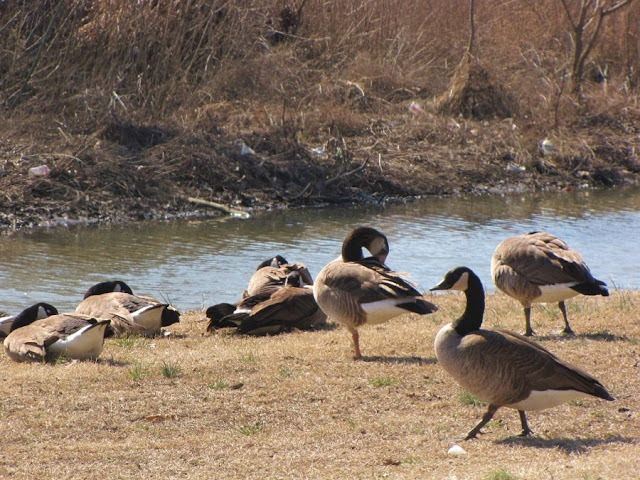 The land between Riverside Drive and the Arkansas River beginning just north of 81st street and running south for nearly a quarter mile belongs to the Muscogee (Creek) Nation and has become the site of a very large Casino complex. It began as Creek Nation Bingo in 1984 and has evolved to a Casino that rivals those found in Reno or Las Vegas. Although Sue and I have never been in the casino we drive by it many times a week as it is on the way both to our church and the Walmart. It seems like every time we drive by it has grown a little more. Tonight I stopped on the way home from choir practice to take a picture of it all lit up with colored lights. 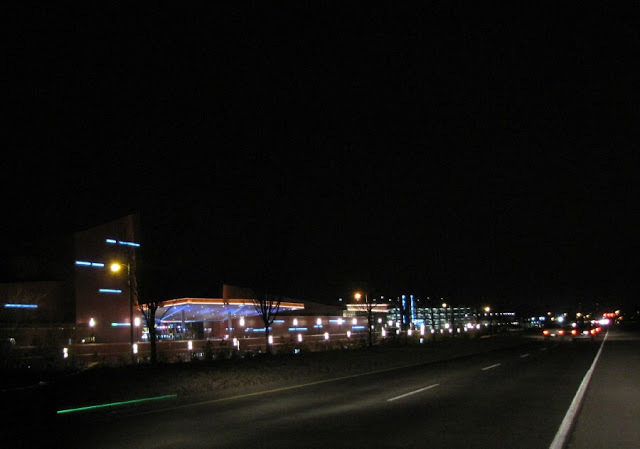 Oklahoma’s 29 gaming tribes contributed nearly $106 million to the state of Oklahoma in fiscal year 2009, according to the Office of State Finance. That figure was about $81 million the previous year. Most of that money goes to education, but $250,000 is set aside each year for problem gambling assistance through the Department of Mental Health and Substance Abuse Service. Wikipedia has a good article on the evolution of Native American gambling enterprises HERE. The Creek Nation has a website for the casino HERE. 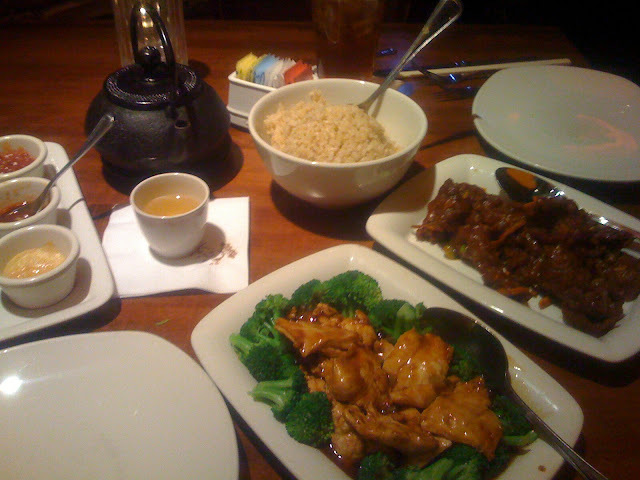 This is P. F. Chang's Chinese Restaurant in Tulsa's Utica Square. The decor inside is attractive with several replicas of the terra cotta warriors found at the tomb of Qin Shi Huang the First Emperor of China. 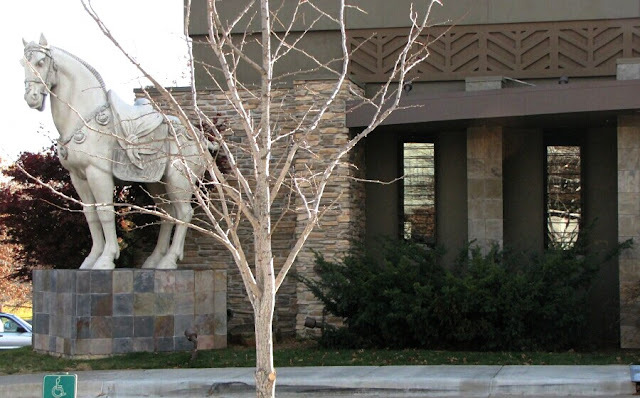 The horses which flank the exterior of the restaurant are from the same site. We like this place. It is attractive, the service is good, they have a nice menu, moderate prices, and most importantly the food is tasty and fresh. 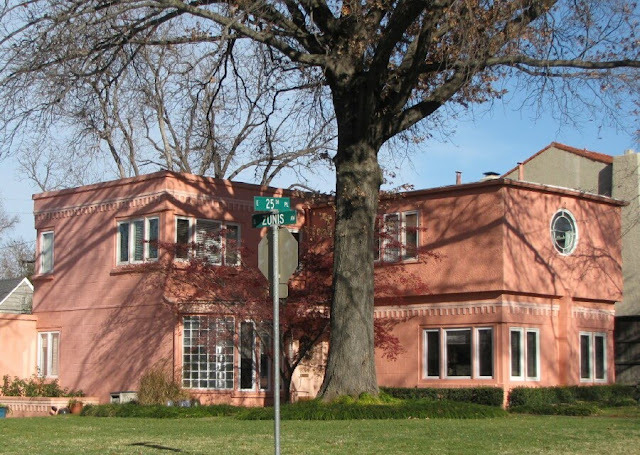 With a unique style and flamingo pink color, this old house stands out in its neighborhood. The windows are interesting. 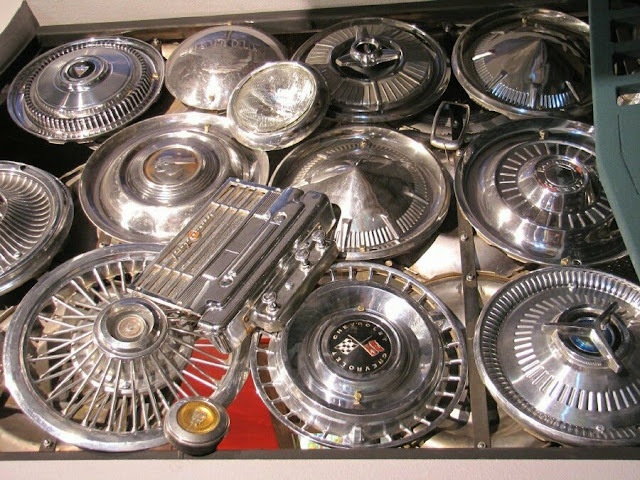 I would like to see the round window from the inside. The tree at its center is enormous. Dogwood tree in my back yard. February 7, 2019. Click to play, pieces rotate. Enjoy! 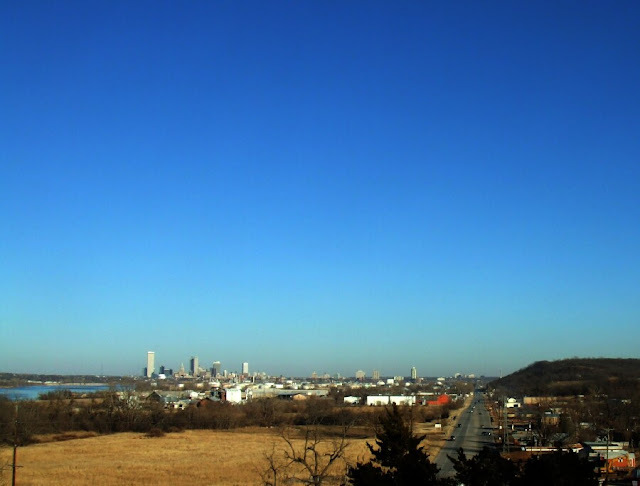 Today there is a beautiful clear blue sky over the city of Tulsa. The Denver Avenue bus station opened in 1998 to replace a much older facility. 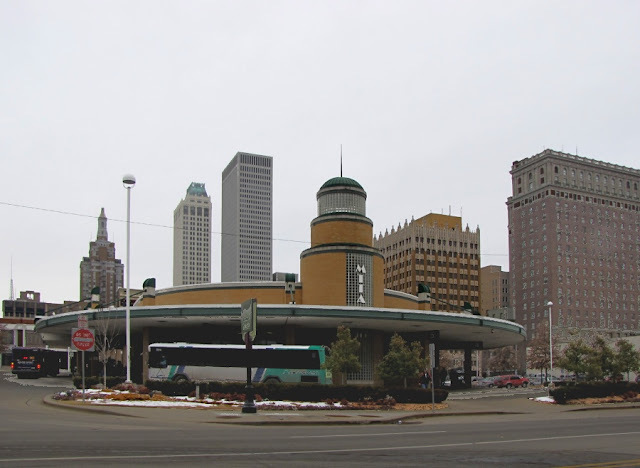 It is the main station located in downtown Tulsa at 319 S. Denver. 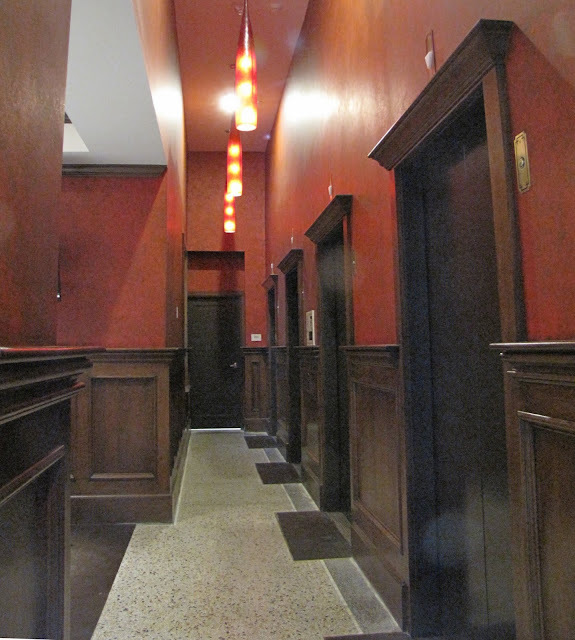 It was constructed in an updated Art Deco style with a round canopy which goes all around the building. It is very attractive building although today's gloomy weather does not do it justice. The glass block tower lights up at night. 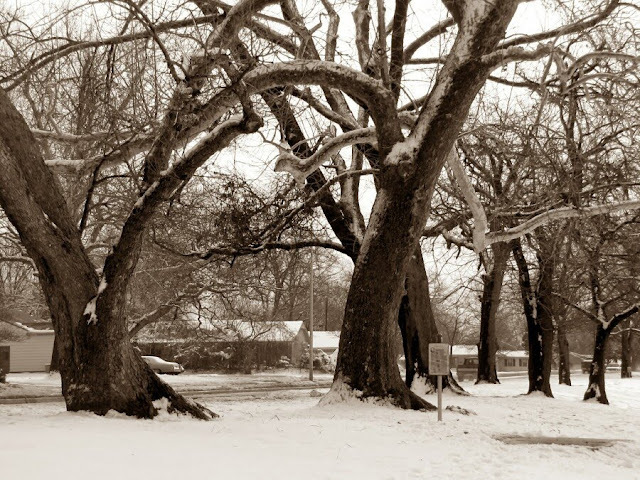 Susan says this looks like two trees dancing. I like that. 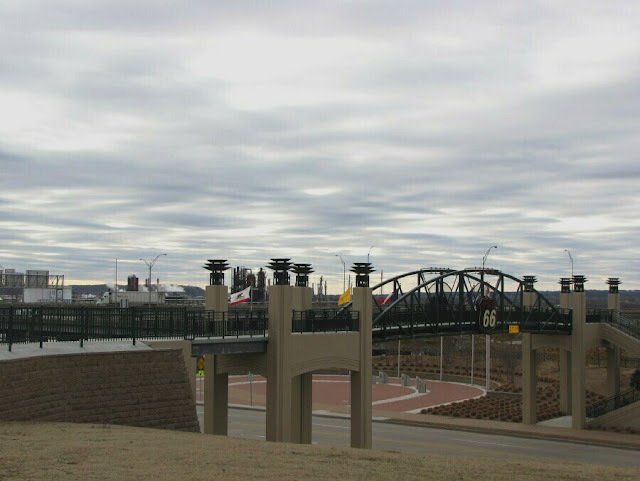 This winter has been unusual in Tulsa. 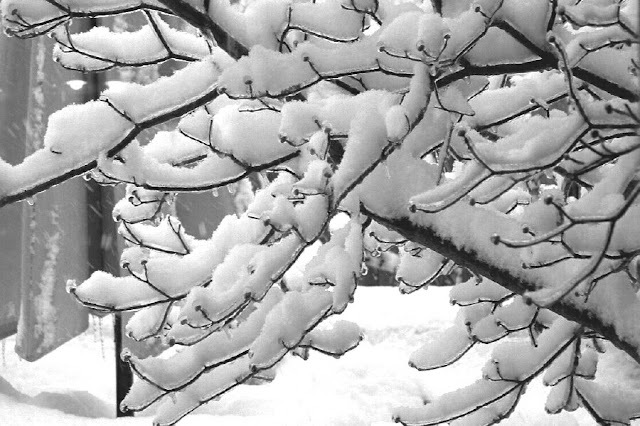 Usually we do not get much snow but so far this year we have had two significant snow falls. 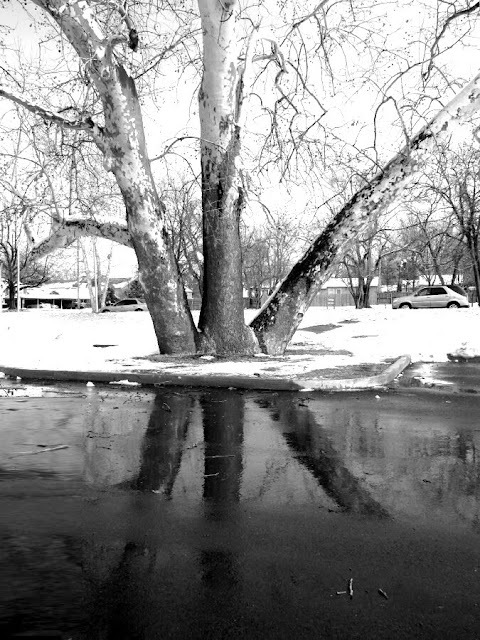 Generally the snow melts off fairly soon and this part is true to form. 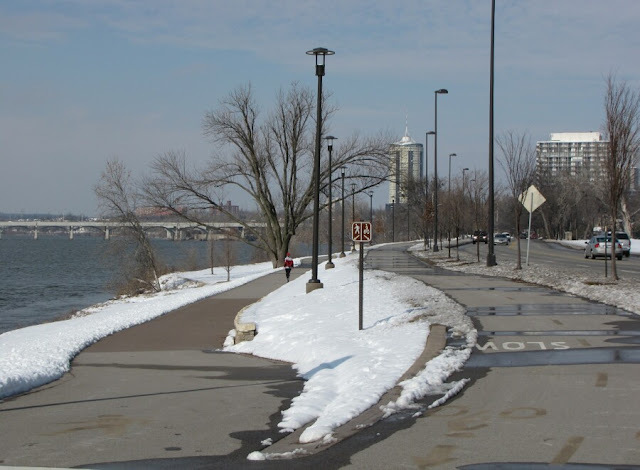 The streets are all clear and so are the Riverpark trails which run the length of the Arkansas River as it winds through Tulsa. The trails have been greatly improved since last year, new lighting fixtures and resurfaced; runners to the left, bicycles to the right. There is a section of 101st Street between Yale and the river where the trees arch over the street and make a kind of tunnel. I admire it in the summer when it is green and in the fall when it is in shades of red and gold. 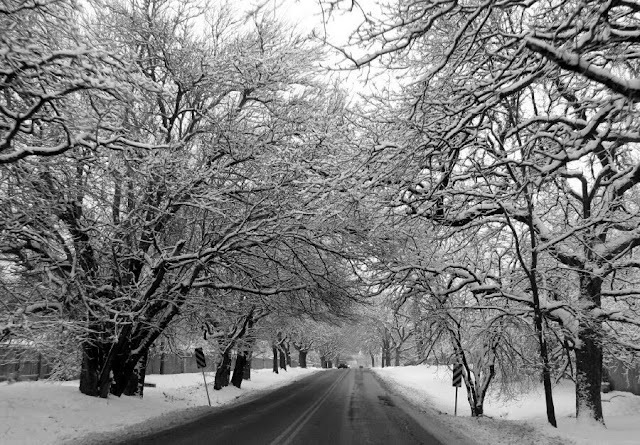 Usually it is bare in the winter but today the snow covered the branches and it was a lacy pattern of black and white. 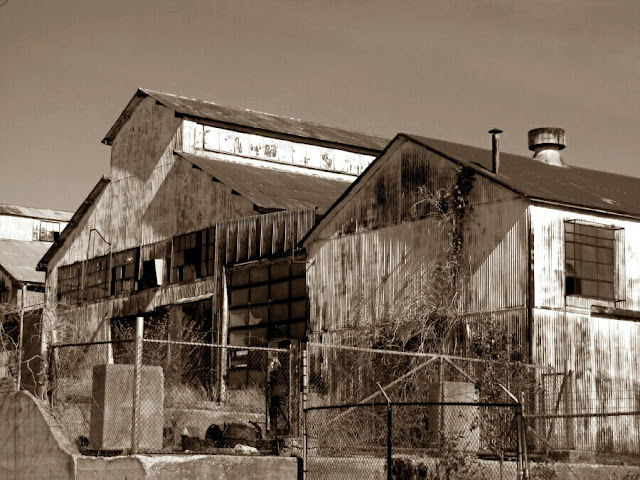 City Daily Photo Blogs, Theme Day February 1, 2010, "wood"